Rowers above the age of 21 are considered master rowers, the age group that forms the bulk of the Des Moines Rowing Club. Male, female, and mixed crews (equal gender numbers) row in two- four- or eight-person sweep boats. Each crew usually rows once a week, often more. While many of our rowers have graduated from our learn-to-row program, we welcome rowers and coxes transferring from other clubs. Rowers at ages 19 and 20 are are not old enough to row at the master level. We welcome these rowers and will try to offer a rowing experience at their level. 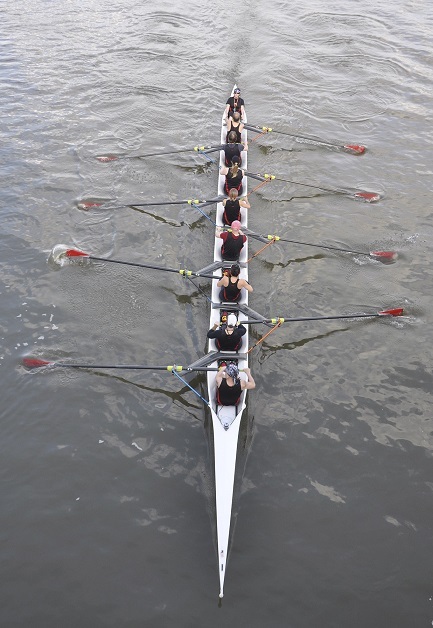 Typically, rowers in this age group are collegiate rowers who join the club to train during the summer. We learn as much from them as we hope they do from us. Rowers in high school who are not yet 19 train in our Junior program, an adult-coached supervised program with regular practices and opportunities to compete at regattas out of town. This program is overseen by a Junior committee which includes club members, as well as a representative rower and parent. Click here to find out more about our Junior Program. Each summer, club members voluntarily run a Learn-to-Row program for anyone in the community. The program consists of a 16-week training course with the option of rowing as a novice in the Head of the Des Moines Regatta in September. The club currently trains about 72 new rowers each year. Novices pay a nominal fee for their first season and benefit from club volunteer training and use of club equipment. Click here to find out more about our Novice Program. To find out where you might fit in, contact our Rowing Director. For a list of our sweep rowing equipment, go to our Equipment Policy.